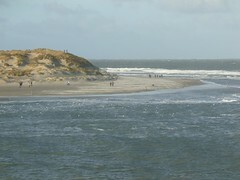 A stormy day in the north of this country, with force 10 winds being reported on Vlieland - where I was only a week ago. Gusts are nearing 70 mph. Storm damage is apparently being reported elsewhere in the north of the country. 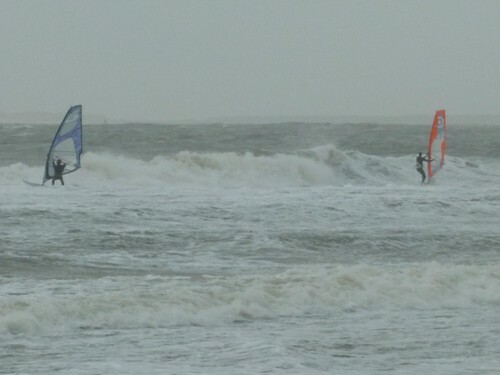 Here, 70 miles from the sea, gusts are at galeforce, 40 mph. Although it was raining this morning, it is now dry. The stormforce winds in Scotland have wreaked havoc, with lorries and buses blown over, most major rail and road bridges closed, roofs ripped off buildings and severe disruption on transport generally. The airport terminals at Glasgow and Edinburgh are damaged, so I hope I can pass through there on my way back to Stornoway tomorrow, Wednesday. 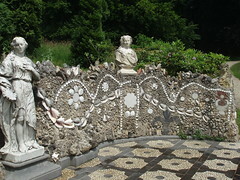 I am putting the Shell Gallery back under wraps until my return to Holland at some stage during 2012. Atlantic Lines will become my main blog again as of this coming Thursday, January 5th. I'll keep Facebook contacts updated on my journey through tomorrow. Although the day started cloudy, the sun came out in the afternoon and it was quite bright and sunny. As I type this, the sun has set 40 minutes ago and darkness has fallen. Nonetheless, even those 15 minutes make a noticeable difference already. 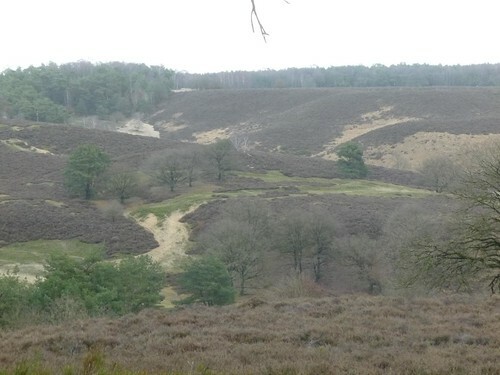 Went out for a 7 mile walk with my dad round the woods and heathlands to the east and north of here, starting at 1.30pm and returning at the stroke of 4pm. It's easy to clock up the miles round here - but beware of the steep inclines. 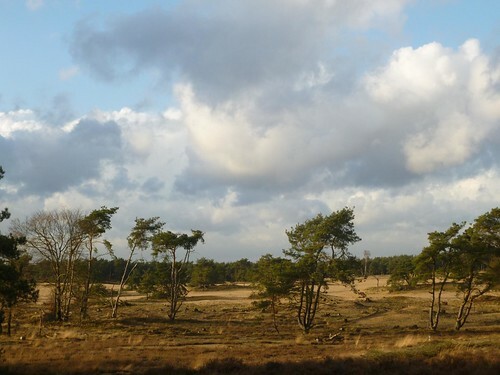 New Year's Day was a wet and mild affair in Holland, with the mercury as high as 14C / 57F in places. That's all I have to say about the weather. Fireworks tend to be a major news item on New Year's Day, with the usual litany of damaged eyes, limbs and other body parts. No major disturbances, unlike previous years: the police had done their homework and were prepared, not just engaging against trouble makers but also with the populace on the streets in advance. I wish you all a happy, healthy and prosperous 2012. On New Year's Eve, we have a family birthday. So, off we went on the train (again). 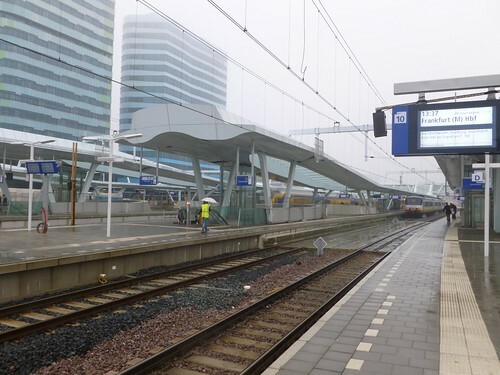 To that end, we took the local bus to Arnhem, then the fast train to Utrecht (40 miles to the west) and then a stopping service to a halt near Hilversum. And reversed the process in the evening. 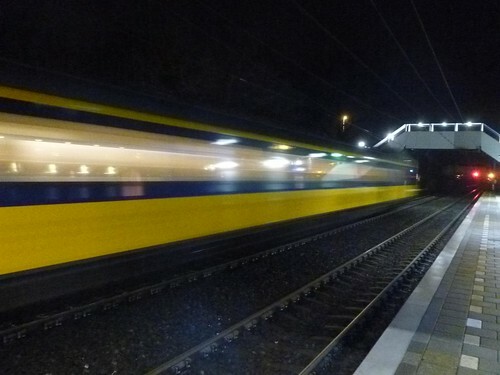 On New Year's Eve, trains stop running in Holland at 8pm, meaning you must be at your destination well before then. Which we managed. 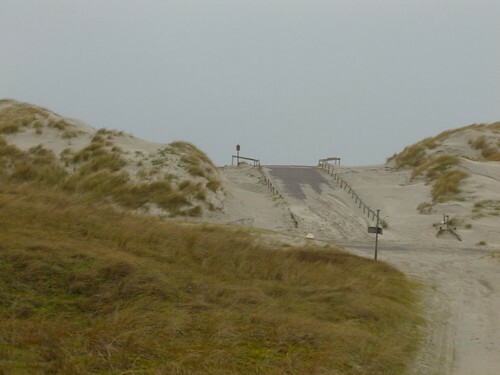 It was with considerable reluctance that we left our comfortable abode in the dunes and headed for the ferry this morning. The sun was shining, although it was still feeling cold in the wind. 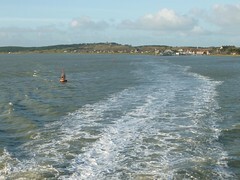 The MV Vlieland headed off at 11.45 and quietly carried us back to the bustle of the mainland. 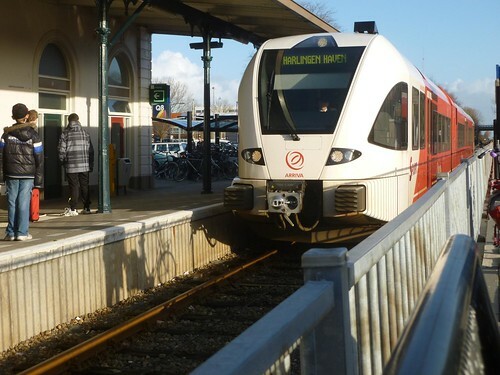 We walked to the town centre of Harlingen to catch the train at 2.06pm, and three hours later we jumped off at our familiar stop just outside Arnhem. It was just after 5pm and it was dark. 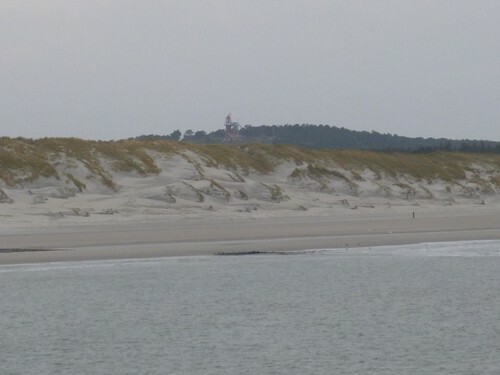 And that was our trip to Vlieland. 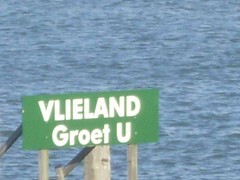 It is 50 years ago this year that my father first went to Vlieland. If anything, the weather today was worse than yesterday. 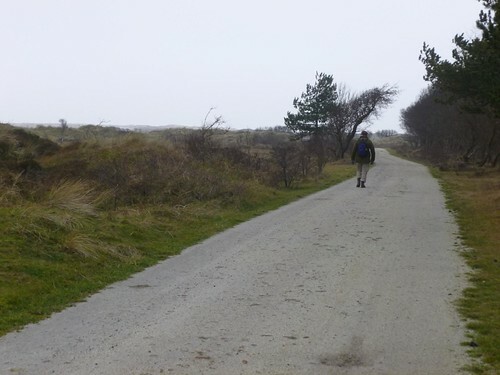 We ventured out on the bicycles, but were battling the force 7 winds head-on along the main road through the island. 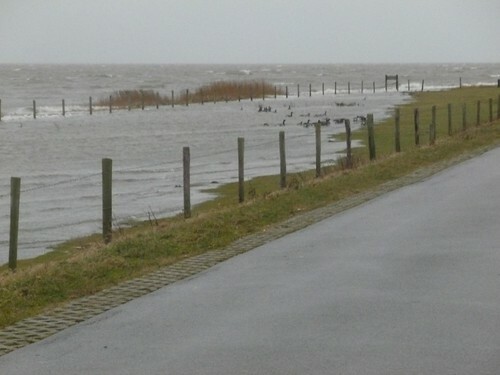 The midday high tide had flooded the meadows along the road, giving the migrant geese an unexpected swim. 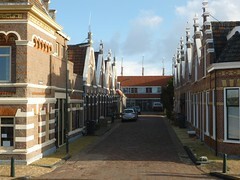 We turned inland half-way to Lange Paal and decided to turn back. Just as well - as we came back to the Snik it was pouring. Cyclists coming the other way looked thoroughly miserable. After lunch, the clouds broke and the weather settled down to showers. 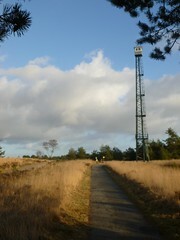 We headed out once more, this time for the walk around the Northeast Corner. 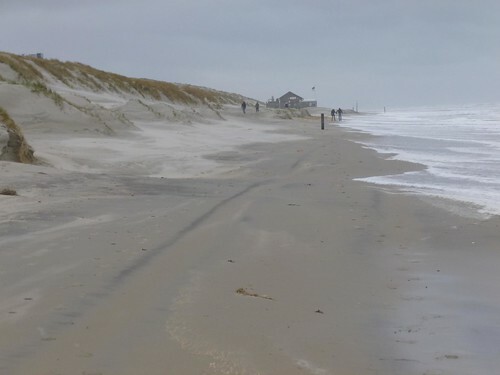 The tide was still high, and we only had about 30 to 50 feet of beach to walk on. Upon passing the NE Corner, we came across three seals with young pups - one of them only 3 days old, we were later told. 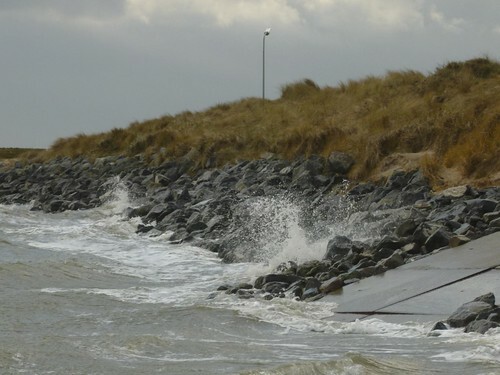 It was impossible to reach the harbour breakwater, as the sea had fully flooded the beach there. 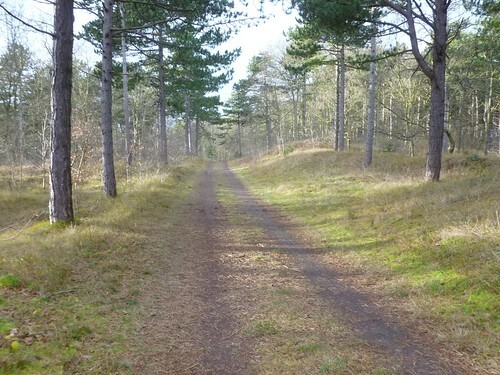 So, we cut inland along the marina and into the forest behind. 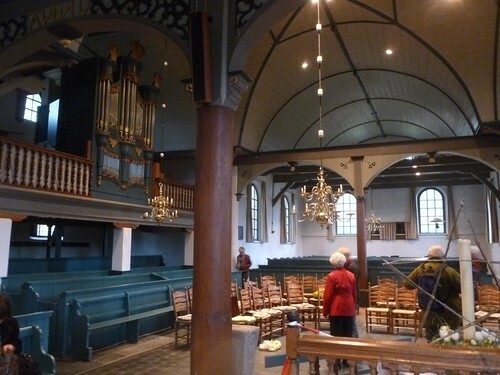 Had an amble through the village, and popped into the church where we had a chance guided tour. 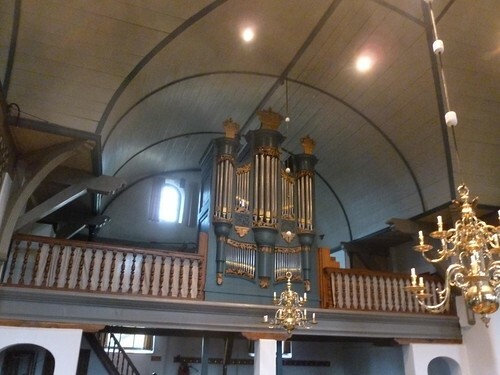 The church, which goes back to the 13th century, was constructed using flotsam and jetsam, thrown up on the tide. 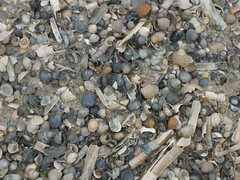 A lot of it came from shipwrecks. 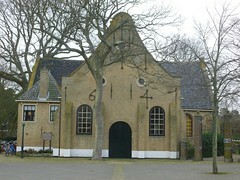 Until 1736, Vlieland had two villages. 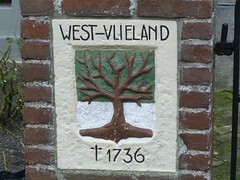 West Vlieland was swamped by the sea, and its heraldic crest ominously depicts a barren tree. 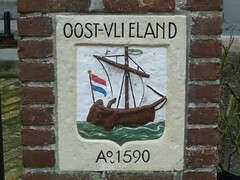 Oost Vlieland [East] remains a vibrant community of 1100 souls. 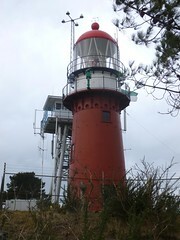 Their number is swollen by 8000 tourists at any one time during the summer. 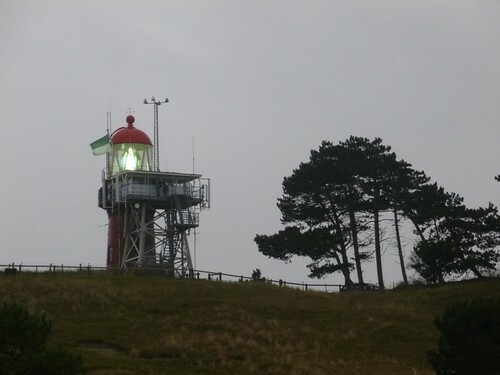 We returned to the bungalow via the lighthouse, which sits on top of a 150 feet dune, overlooking the village. Strong winds today, force 6 to 7 on the Beaufort scale. This made it feel very cold, and there was also occasional rain. Not a very pleasant day, but it was not so bad as to keep us indoors. After a quick foray into the village for shopping, we set out on foot across the island. 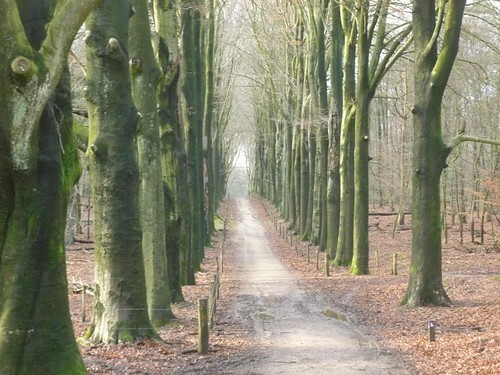 First off along the shell-paved cycle-track towards Lange Paal, an old marker about 2 miles southwest of the village. 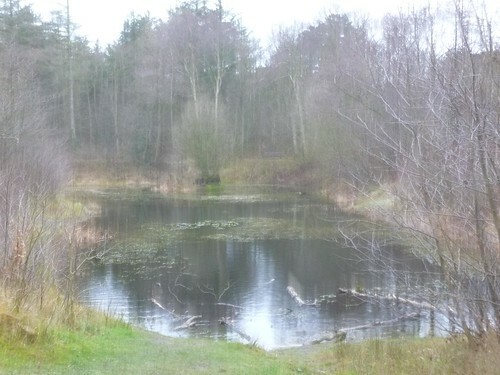 This is now home to a back-to-basics campsite. 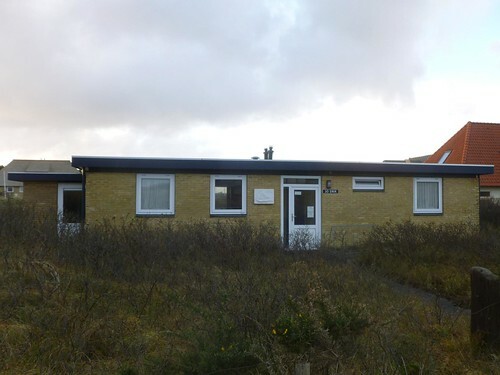 Having come to Vlieland for 46 years, this was the first time I have seen the campsite completely empty. 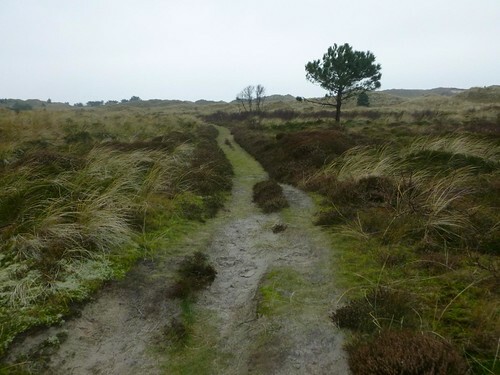 We then followed the marked walking trail through the forests and dunes to the Nieuwe Kooi, a mile further on. 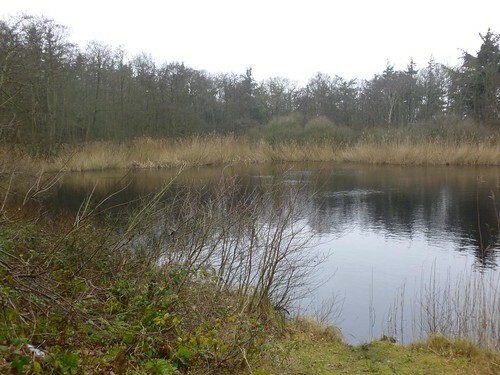 A Kooi (coy) is a place where wild ducks were once lured by half-tame ducks, and then caught for slaughter. No, not nice, but that's the way people used to eat. 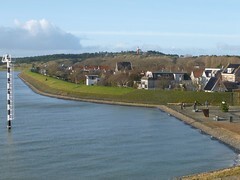 After a lunch by the old Kooi pond, we head for the beach at Dam [breakwater] 20, to return north and the bungalow. As we were blown north, we came across a seal pup. It was lying on its back, apparently quite content. Its mother was probably out fishing in the sea nearby. Warnings have been posted not to approach the seals, as they have vicious teeth. Upon return to the Bayhouse restaurant (which sits on the beach) we had a cuppa to warm up. 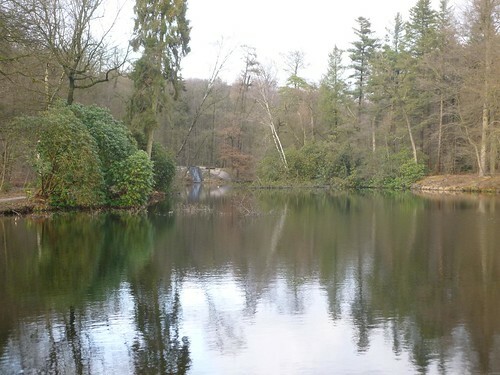 We then wound our way through the forest and past the Tower Pond back to the bungalow. I realise that I am bombarding you with a list of (half-translated) names of a place most of you will never have heard off. The map above probably doesn't help much, but I hope the pics compensate. The dreich weather doesn't do them much justice. 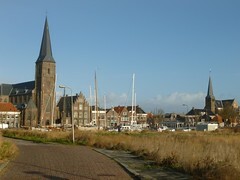 At 10 o'clock, we left by train for the northern port of Harlingen. This is a 3-hour journey, requiring three changes of trains on the way. However, this is a smooth process, and at 1pm, we duly alighted at Harlingen's new Haven [Harbour] station. 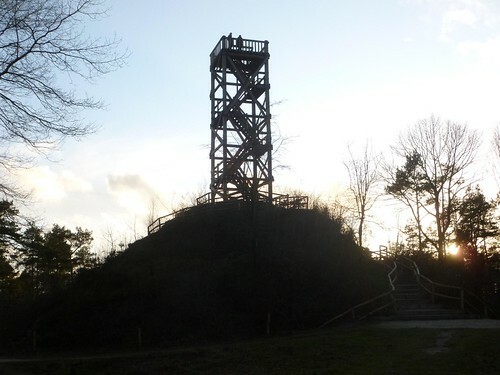 It is only a hop and a step to the terminal from where the ferries to Vlieland (our destination) and the neighbouring island of Terschelling depart. 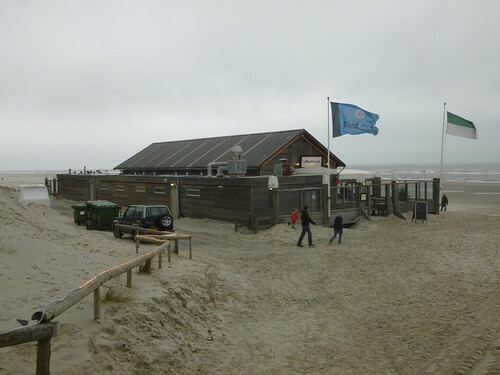 The terminal was packed with people destined for Vlieland this afternoon. As the ferry wasn't due off until 2.15, we nipped into the restaurant - where the waitresses had to perform acrobatics over a doglead. This was stretched across a passage way between tables, as the attached canine was playing games with a much smaller specimen at another table. 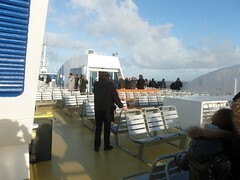 We went on board the MV Vlieland as one of the first passengers. Just as well, as the boat was packed to the gunwhales. 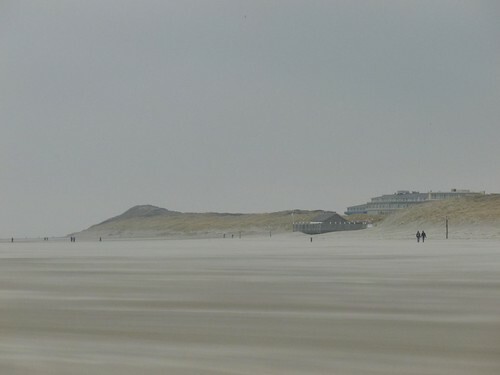 It was a misty afternoon, and we quietly cruised in amongst the shallows past the old island of Griend to Vlieland. 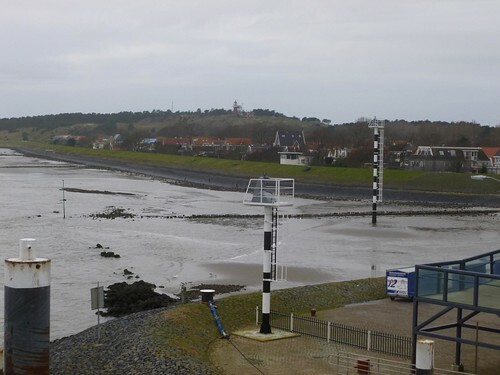 Things always get a bit lively in the Stortemelk, the channel between Vlieland and Terschelling. 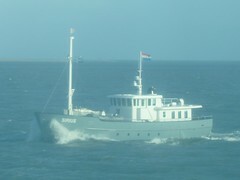 This is exposed to the North Sea, for about 10 to 15 minutes, we catch the swell. 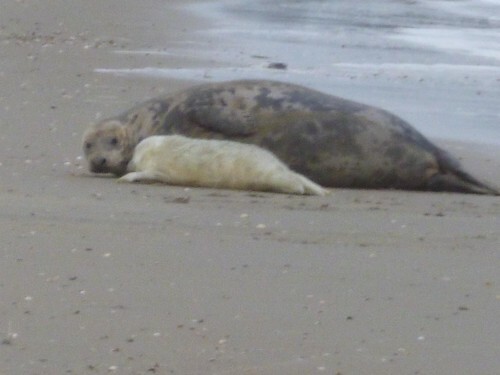 As we swing round the North East Corner (of Vlieland), seals can be seen lying on the beach. As we later learn, these were flushed off their usual place, the sandbar of Richel, in a recent storm. 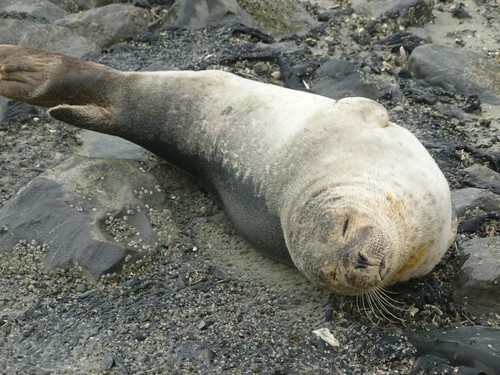 The seals are presently having their cubs. 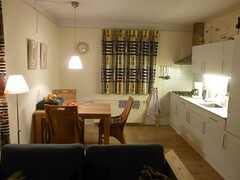 We got off the ferry at 3.45 and went to the Tourist Office to collect the keys for the holiday bungalow, named Snik. 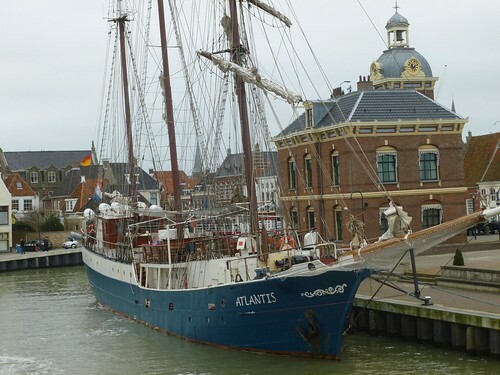 A Snik is a type of sailing ship from years gone by. 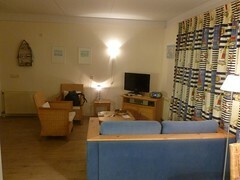 The bungalow comprises of two houses, and my father and I have the larger section for ourselves. 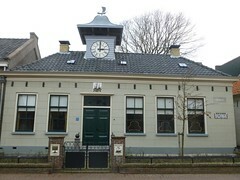 Upon entry, the clock showed 5.30pm - showing that it had not been put back following the clock-change in late October. In other words, it had been unoccupied since. The sun was setting and by 5pm it was dark. After a quick meal, we made it an early night.